Four bands from across the globe. A little something for everyone. If you want a release with some of the top bands in the game today, this is the release for you. Personally, I got this for Five Days Off since I'm a big fan of their melodic style. Their drummer is really smooth on the drums as well. 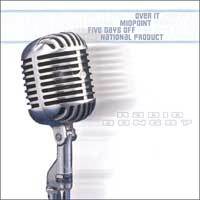 Over it bring that melodic/emo touch, National Product have that pop punk feel, and Midpoint bring the pop punk as well. Over it and National Product each play an acoustic song on this release, which calms thing up and brings another element. Good job of Triple Threat Recs to get these bands for this awesome cd. You won't be disappointed.